Friends are made by many actions, but they can be lost by only one. We must not only build right relationships but we must also maintain them. We must deal with relationship problems in God's way. In this lesson we will consider such problems as disagreements, offenses, enmity and barriers, and rejection. Though we are members of the one body of Christ, each believer is a unique individual. There will be times when we will disagree. There is nothing wrong with disagreements, but they can lead to serious problems. Let us consider some things we should do when there is a disagreement. We must be sure that our spirit is right. We may be right in what we say but wrong in the way we say it. When our attitude or spirit is wrong, God says that we are wrong. Wrong attitudes come from wrong thinking. 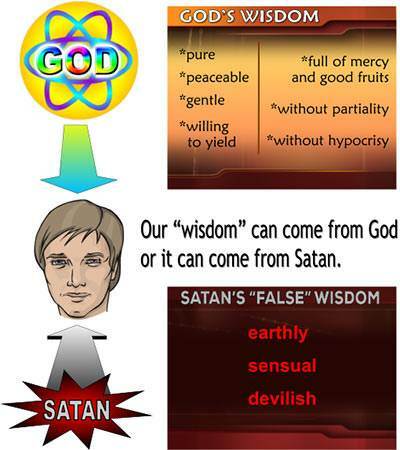 The Bible says that our "wisdom" can come from one of two sources: It can come from God, or it can come from Satan. 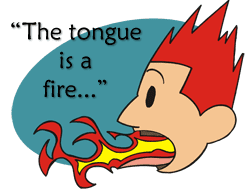 We must control our tongue. We must care enough to listen. Communication is vital in any meaningful relationship. It is especially important to be able to communicate with someone when there is a disagreement. How sad are the words, "He (or she) just wouldn't listen to me." Usually, it is difficult to deal with a problem when someone is angry and upset. In this kind of situation, the best thing one can do is to listen. When a person is perturbed and upset, his emotions can be compared to a balloon which is blown up tightly. If there is no release and the pressure continues to build up there is sure to be an explosion. But if you listen intently without interrupting, the "balloon" will deflate and the pressure will be relieved. Then you will be able to deal with the problem. We must try honestly to see things from the other person's point of view. There is a reason why the other person thinks and acts as he does. Try honestly to put yourself in his place and see things from his point of view. You may find that he is right and you are wrong. Christians should learn to be patient with other people, not taking offense easily. The Bible says, "Love suffers long and is kind." But there will be offenses. 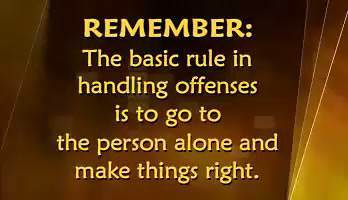 The basic rule in handling offenses is to go to the person alone and make things right. There are two kinds of offenses with which we must deal: (1) Those which we commit against others, and (2) those which others commit against us. Let us see how we are to handle each of these. Offenses which I have committed against another person. 1. Take full responsibility for my offense, laying no blame to anyone else. 3. Ask the person to forgive me and wait for his answer. Of course, if I have caused someone to suffer a loss, I must also make proper restitution. Offenses which another person has committed against me. When someone has offended us, our natural inclination is to tell another person how we have been mistreated. This is absolutely wrong. We must not tell anyone until we have first gone to the one who offended us. We must give him an opportunity to apologize or, in the case of a misunderstanding, to explain. Whether we have offended someone or someone has offended us, the thing to do is to go to that person alone and make things right. When two people have trouble between them, they can solve it by humbling themselves before God and forgiving and forgetting. Jesus is teaching us here that we must forgive boundlessly. To forgive "seventy times seven" does not mean that we are to forgive our brother 490 times and no more. 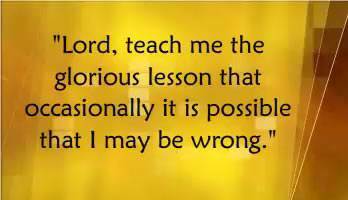 No, the Lord is teaching here that forgiveness must become a habit with us. There is to be no counting of the number of times we forgive. Remember, Jesus said that it is impossible to be right with God unless we have asked forgiveness from those we have offended, as well as forgiven those who have offended us. For a fuller understanding of the Lord's teaching on handling offenses, read chapters 5 and 18 of Matthew and chapter 17 of Luke. When offenses are not properly handled, enmity and barriers come between people. Enmity is a feeling of ill-will or hostility toward another person. 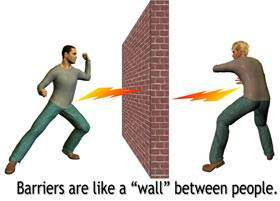 Barriers are like a "wall" between people. Where enmity and barriers exist, there is no fellowship and no real communication. To understand how God dealt with enmity and barriers, we must go back to the very beginning of the church. At first, the church was composed entirely of Jewish believers. Later on, the gospel was preached to the Gentiles (those who were not Jews), and many of them believed and were added to the church. This created a problem because of the long-time enmity and barriers that existed between Jews and Gentiles. The Jews considered themselves superior to the Gentiles and would not even eat with them. The Gentiles likewise despised the Jews. How did God deal with the enmity and barriers that existed between Jews and Gentiles? He dealt with it by the cross! The Bible tells us that all believers—both Jews and Gentiles—were crucified with Christ. Of the Jewish and Gentile believers, God made "one new man." Jesus Christ Himself is the Head, and the believers form His spiritual body. This is true, not only of Jews and Gentiles, but of all believers. We too have been crucified with Christ that we might become members of the one body of Christ. 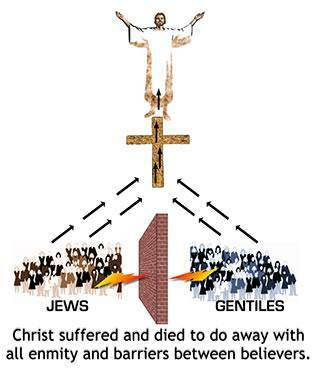 By means of the cross, Christ has done away with every barrier that separates us from one another. By His death on the cross, He has "slain" all enmity between believers. Christ has made every believer one with Himself and one with other believers. 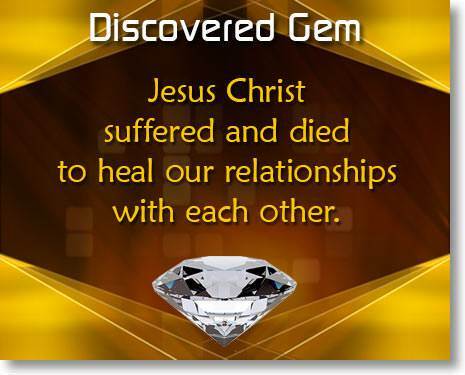 Jesus Christ suffered and died, not only to bring us to God, but also to heal our relationships with each other. To allow any barrier or enmity to stand between me and another believer is a sin which denies the work of Christ on the cross. Concerning our relationship with another person, we can have one of two basic attitudes toward him: (1) an attitude of rejecting him, or (2) an attitude of receiving him. To reject another person means that you do not accept him as he is. Rejection is an attitude which says, "You must change to please me if you want me to accept you." 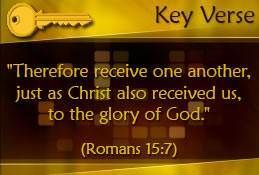 The reason that we are to receive one another is that Christ has received us. He died for us when we were yet sinners. He did not say to us, "I will not receive you until you change." No, He received us fully and freely, just as we were, and extended to us all the privileges and benefits of a child of God. This is the attitude God wants us to have toward others. Whether we realize it or not, the attitude which we have toward another person has a profound effect on that person. · The attitude of rejecting a person prevents God's love from flowing through you to that person. 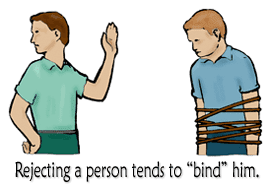 It tends to "bind" him and to prevent him from being what God wants him to be. · The attitude of receiving a person allows God's love to flow through you to that person. 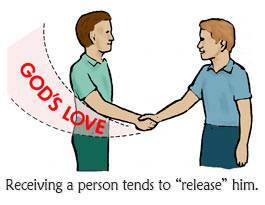 It tends to "release" him to become what God wants him to be. "Do I have to go along?" sulked our 15-year-old as he dragged his feet across the floor. "I want to stay home with my friends. Besides, the car will be full, and who wants to drive 600 miles folded up like a pretzel in a stupid old car?" Brad's display of smoldering anger now pinpointed a growing problem which had plagued our relationship recently. Deep down, my heart confessed to an increasing resentment toward Brad. I didn't like his friends nor the way he wore his hair, and I felt especially sick about the music he was into. Communication between us had begun to be strained. Brad unwillingly accompanied us, and somehow we scraped through the week. But when we got back home, we found ourselves, as parents, on our knees before God. "Lord," we prayed, "we know only too well that this could spell real disaster, and not just for Brad. Surely others will be hurt as well if he continues on in rebellion. We will not let him go on like this. God, you have got to give us the answer," we demanded. "Please show us." 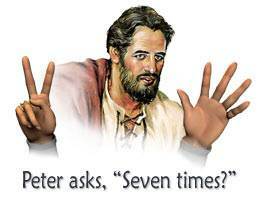 I was hardly prepared for God's answer. He focused His searchlight on my heart attitudes, and that which had been shadowed for too long suddenly became painfully evident. "As long as you choose to reject, resent, and condemn Brad, My hands are tied," God said to me. "You are standing in the way of My touching your son. You are the real problem." "Oh, God," I groaned in consternation. He continued searching me. "When I accepted you in My Son, Jesus, did I demand that you become holy and righteous before I accepted you? Were there not yet many things in your life which displeased Me? Yet, I enfolded you in My love and acceptance for My Son's sake." I fought hard with His next words. "Will you now go to your son and confess your wrong attitudes and resentment, criticism and rejection? Will you ask his forgiveness for your sin against him?" "But Lord," I remonstrated. "He is rebellious and he is wrong!" "I am aware of that, my child, and I have a remedy, but you are the greater problem. What about it? I can wait as long as you make Me wait, but if you refuse to break, I can't promise that you won't lose your son." As I struggled with God's proposition, the issue became excruciatingly clear, and while I had no promise as to what would happen in my son, I understood what I, his father, had to do. 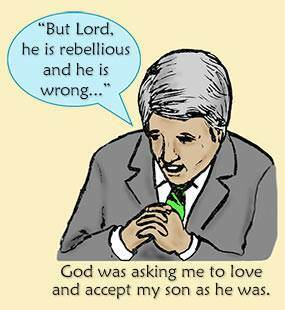 God wasn't asking me to accept my son's rebellion. He was asking me to love and accept him genuinely and unconditionally, as he was and not as I wanted him to be. While the humbling was very painful to me, suddenly I became too afraid to not let my will be broken. The consequences for Brad and for me would simply be too heavy to bear. I knew then that God was waiting for me, not my son. As we found ourselves in each other's arms, tears washing away my built-up resentments against Brad, an amazing thing happened. Brad, too, began to weep and with a broken heart acknowledged his rebellion and asked forgiveness. Then turning to his mom, and embracing her, he wept out his wrong attitude toward her and asked her forgiveness. Two years have passed since that day. So deep was God's work at that time that, even though I have failed in many ways since then, yet Brad has moved steadily onward with the Lord. Get Right with People Now! As you have read this lesson, has God spoken to your heart about some relationship that is not what it should be? Perhaps there is an offense that needs to be cleared up. It can be made right if you will humble yourself and obey God. Is there enmity between you and another person? Is there a barrier between you and another believer? The Lord Jesus Christ suffered and died that He might "slay" the enmity and remove all barriers between believers. Is there rejection between you and another person? You may be a son or daughter and you have rejected your father or mother. You may be a parent and you have rejected your son or daughter. You may be rejecting your wife or husband. You may have a brother or sister whom you have rejected, or it may be someone else. Whoever it may be, will you give up your rejection and allow God's love to flow through you to that person? Obedience is the way of blessing. Whatever God is speaking to you about, will you obey Him?